Size: Male drone - 1/2" to 5/8", queen--3/4", female worker - 3/8" to 5/8"
wings. Larvae are white grubs that stay home in wax combs in the hive. Biology and Life Cycle: Bees are social insects that live in colonies numbering up to 80,000 or more. <?xml:namespace prefix = st1 ns = "urn:schemas-microsoft-com:office:smarttags" />Queens lay eggs in wax cells, and workers feed and care for the larvae. Royal jelly is fed to certain larvae, causing them to become queens. Mated queens leave with a swarm of workers to start a new colony. Bees overwinter in hives and live on stored honey. Workers are sterile females and the most numerous. The sole function of males bees, called drones, is to mate with the queen - but only once; they die immediately after mating. 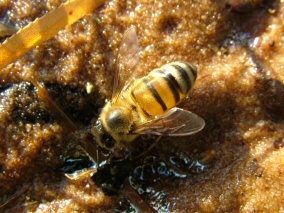 Unmated males are killed and dumped from the hive. And they say it's a man's world! Habitat: Hollow trees and hives kept by beekeepers. Many flowering plants. 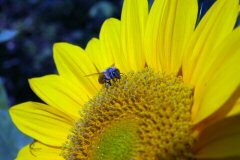 Feeding Habits: Workers feed on nectar and honey and gather pollen. Larvae feed on honey and royal jelly. Natural Control: Mites and the unnatural synthetic pesticides. Sevin is one of the worst pesticide choices left on the market. It is extremely toxic to bees. None needed. Economic Importance: Honey and bee’s wax production and pollination of many ornamental and food crops. Insight: Worker bees are able to sting but only once because the stinger is left inside the victim. 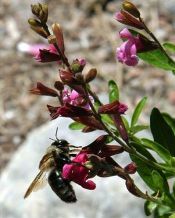 The African bee or "killer bee" is closely kin but much more aggressive. The latest research suggests that our nonaggressive bees breeding with the "killers" is resulting in moderately aggressive bees that produce a lot of honey. Tracheal and varroa mites have caused great destruction of honeybee colonies since the 1980s, but painting the hives a dark brown color helps. As the temperature of the hive increases, the bees fan more and their bodies heat up, killing the mites. Tracheal mites are microscopic and responsible for about 10 percent of the mite destruction to honeybees. Varroa mites are much larger and more destructive, causing about 90 percent of the mite damage. Planting lots of flowering plants, especially those rich in essential oils, such as mints or other fragrant herbs, helps to eliminate the mite problem. First of all we need to strongly remind you that bees, honeybees are all beneficial. But if they are swarming and a problem they can be repelled with various sprays including citronella, citrus, and garlic/pepper tea. To treat hives wait until dark. Tap on the walls. Try to run them off without hurting them and the caulk the cracks and crevices. 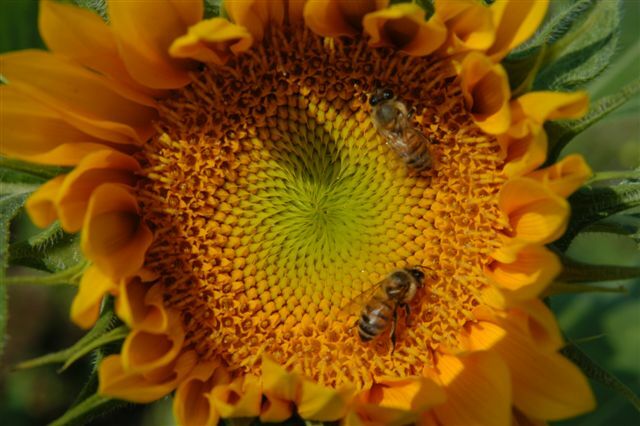 Bees Mysteriously Disappearing Across the U.S.